New ATP Safe Links Policy features—Four new features build upon the Safe Link policies. Per-tenant block list—Provides the administrator the ability to block specific URLs. Email wildcarding for domains and handles—Enables you to save time by writing partial domain/handle names. Split Safe Links policies—Allows Safe Links policies to be customized for specific user lists in the organization, including groups, individuals and divisions. Expanded character limit for URLs—Enables blocking/allowing URLs with longer character lengths. Safe Links Block URL list. Additional details on these new features can be found in the Microsoft Tech Community, as well as on the EOP and ATP product pages. EOP is offered across our enterprise E1, E3 and E5 suites. ATP is offered as both a standalone SKU or as part of E5. Rights management (RMS) decryption in Office 365 eDiscovery—Automatically decrypts RMS-encrypted email messages at export time when you choose the MSG Export option. Unified case management in Advanced eDiscovery. Visit the Microsoft Tech Community for more details about the new eDiscovery features. Unified case management and RMS decryption are included with Office 365 E3. Optical character recognition is included with Advanced eDiscovery in E5. Many organizations have the need to perform supervision of employee communications. This need stems from internal security and compliance guidelines, or from regulatory bodies such as the Financial Industry Regulatory Authority (FINRA). In both cases, failure to have a demonstrable supervision process in place could potentially expose organizations to liability or severe penalties. To address this need, we’ve released the new Supervision feature in Office 365 Advanced Data Governance. Supervision covers not only email communications, but also third-party communications streams, such as Facebook, Twitter, Bloomberg and many more. Visit the Microsoft Tech Community for more details about the general availability of Supervision. 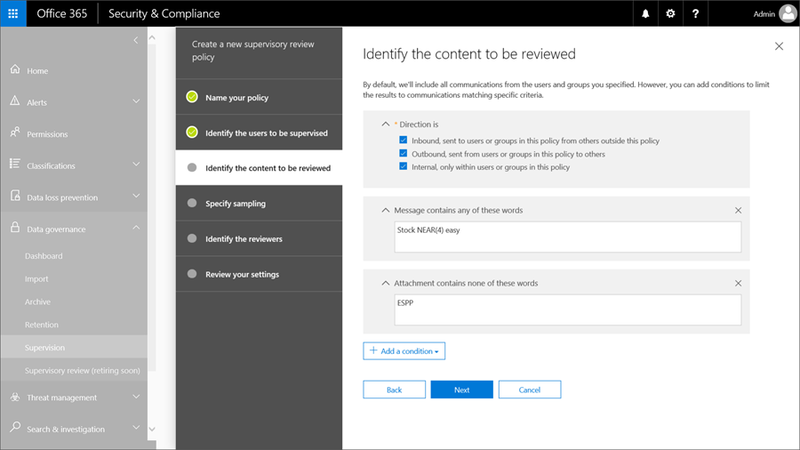 Supervision policies in Office 365 Advanced Data Governance. Supervision is part of Office 365 Advanced Data Governance, which is available as part of Office 365 E5 or the Office 365 Advanced Compliance SKU. In August, we announced our support of Windows Information Protection (WIP) for Office mobile apps on Windows tablets and phones, to help prevent accidental business data leaks while letting users maintain control over their personal data by designating content as “work” or “personal.” We’re pleased to announce we have expanded support for WIP to include the Office 365 ProPlus desktop versions of Word, Excel, PowerPoint, Outlook, OneNote and Skype for Business. This will help provide more comprehensive protection of your business data on Windows 10 devices. To read more about WIP, check out our Microsoft Tech Community blog. 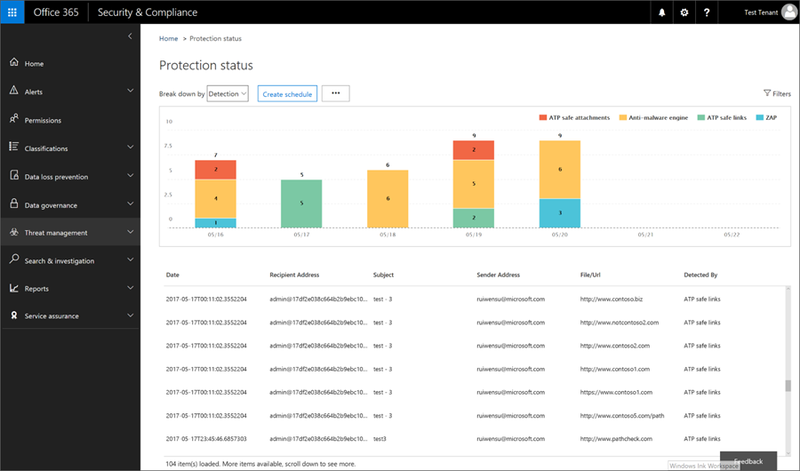 A year ago, we announced a way for you to get greater visibility and control over Office 365 with Advanced Security Management (ASM). Since then, we have added new features to help you better determine shadow IT activity. We also enhanced control over third-party apps connected to Office 365. After these updates, we started hearing that some of you were looking for a way to export alerts to other systems that are integrated into your existing workflows. Today, we are releasing a solution that supports centralized monitoring of ASM alerts with your security information and event management (SIEM) software. 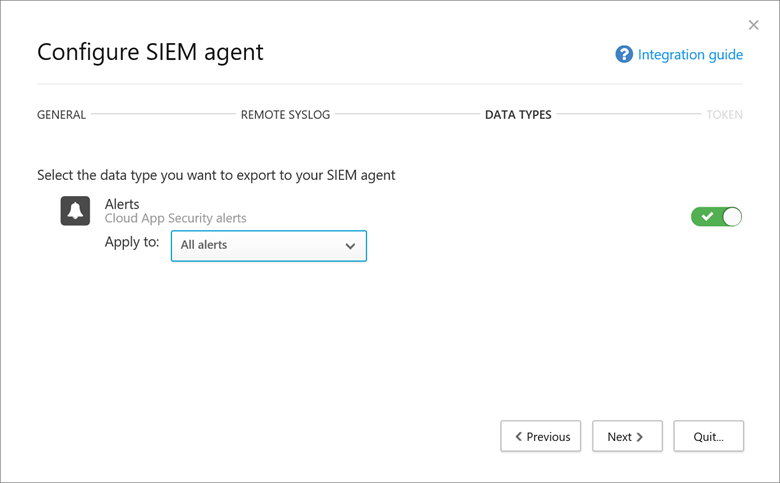 Integrating with an SIEM allows you to better protect Office 365 while maintaining your organization’s security workflow, automate your security procedures and correlate between your cloud-based and on-premises events. Configuration screen for ASM SIEM agent. These new features help broaden and enhance the scope of security and compliance capabilities within Office 365. Join our Security, Privacy and Compliance Tech Community to further evolve your organization’s security and compliance with these services and learn and contribute to security, privacy and compliance best practices. The Tech Community is a great resource to communicate and learn from your peers—as well as offer your insights on the growing importance of security, privacy and compliance.